Rachel Morse, a biracial girl whose mother is Danish and whose father is a black G.I., survives a terrible tragedy that claims the lives of her mother, brother, and baby sister. After the accident Rachel’s grandmother, Miss Doris, takes her home to a predominately black neighborhood in Cleveland. Rachel doesn’t quite fit in with her blue eyes and brown skin, drawing hatred from girls and admiration from boys. Told by multiple narrators, Rachel’s story and the truth about the day her family died unfolds, as she tries to make sense of what and who she is. 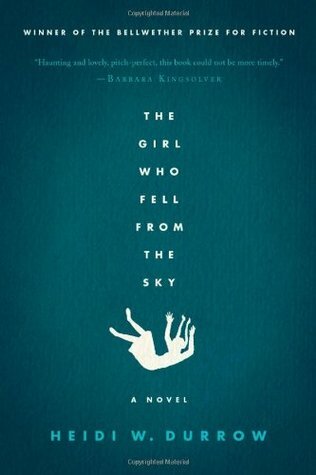 The Girl Who Fell From the Sky is Heidi Durrow’s first novel, and has been given the dubious honor of being compared to Nella Larsen’s novella Passing. The problem with such a comparison is that Passing is far superior, but Durrow should be commended for an admirable attempt at capturing the essence of what made Passing so influential — that is, what does it mean to be black? To be white? Unfortunately, her attempt falls a bit short as she doesn’t explore the theme to the extent that Larsen did, even though Durrow’s novel has about 100 more pages than Passing. It is obvious that Durrow wanted to pay homage to her predecessor — the mother’s name is Nella — but she would have succeeded if she had gone a bit further with the racial division that is more prominent in Passing. Rachel’s thoughts about race are largely internalized, very rarely being spawned by some outside factor other comparing herself to people around her. The novel takes place largely during the ’80s, and while the first couple of chapters are told from Rachel’s point of view when she is in the fourth and fifth grade, the timeline isn’t ever fully explained. She goes from fifth grade to high school in a matter of chapters, with no real way for the reader to know anything about the timeframe except for the fact that one of the characters, Lakeisha, is listening to “Saving All My Love For You” by Whitney Houston on the radio. Rachel’s childish voice makes sense in the beginning chapters, but once she turns 14, and then 16 — with no mention of birthdays to help mark the passage of time — she still has the same simple, naive voice. She has grown up physically, but it seems that she has not matured mentally. Yes, she has learned the truth about the day her family died, and the events that the succeeded them, but has she learned anything about herself? About the world around her? I was expecting a bit more self-discovery, but it was noticeably absent from the novel. If Durrow had gone further with what, a reader would assume, was supposed to be the central theme of the novel — a biracial girl struggling with her identity — perhaps the novel would have been more of a success. For now it is, much like Larsen’s “tragic mulatta” Clare Kendry, simply passing. Tagged heidi durrow, nella larsen, passing, race, the girl who fell from the sky, tragic mulatta.